Two Sudanese men being held at Campsfield House Immigration Removal Centre (Kidlington, near Oxford) have refused all food and vitamins for 11 days, in protest at their detention and treatment. Visitors to both are deeply concerned for their health, and at the standard of medical care they are receiving; the men are willing to continue striking “to the extreme” until they are released or removed to a country they regard as safe. 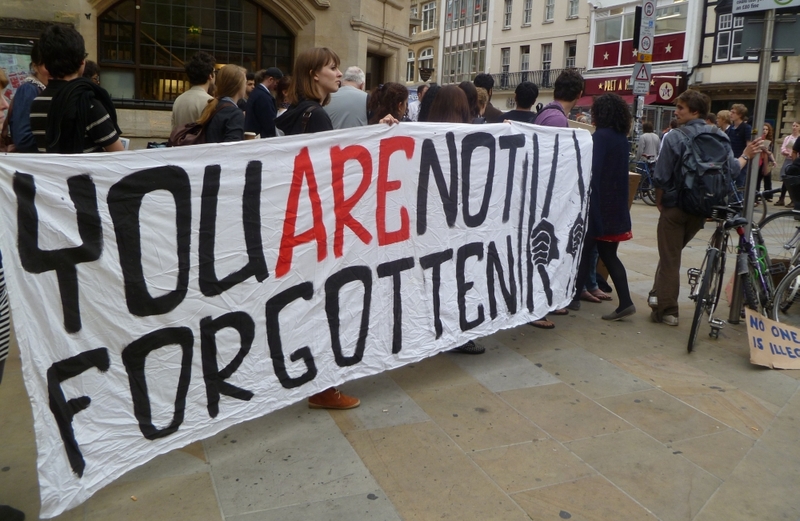 A demonstration in their support, held in central Oxford on June 1, was welcomed by the detainees. A demonstration in support of the Campsfield detainee hunger strikers will take place today Friday 1 June at 6pm at Carfax, Oxford. The demo has been called by the local Sudanese community and various campaigning and human rights organisations. All are welcome. 13 men from Darfur region of Sudan have been on hunger strike for 6 days at Campsfield Immigration Removal Centre in Kidlington, near Oxford. They are all being held in detention without time limit and without any idea as to what will happen to them or when they will be released or removed. They have been held for varying periods of time; the longest being six months. They are demanding that they all be released and granted asylum, but would rather they were removed (to a safe place) than held arbitrarily with no time limit. They have also complained of their treatment inside the centre, saying that they came here asking for refuge, and instead have been locked up and badly treated. One man who was on hunger strike has already been released. They come from all three regions of Darfur and include members of the Zaghawa, Tama, Mirra, Berti, and Tunjur tribes. At least one of the hunger strikers is a confirmed torture survivor with visible wounds, who is well-known in his home town of Nyala and whose name is instantly recognisable to many Sudanese in the UK. Torture survivors are not supposed to be held in immigration detention under UK law, but campaigning groups say that this law is regularly flouted by the UK Border Agency. The hunger strikers requested visits and various supporters from Oxford independently organised visits for the evening of 30 May. Despite pre-arranging visits each of the visitors was turned away on different spurious reasons (some with no reason given) once detention centre management realised they were visiting Sudanese men. (Two other regular visitors who were not visiting any of the hunger strikers but who happened to arrive at a similar time were also turned away with no reasons given.) The first visitors, Nazar Eltahir (Chair of the Sudanese community in Oxford) and Tim Flatman (a human rights activist who regularly travels to Sudan/South Sudan and supports Sudanese and South Sudanese migrants in the UK) were told that the person they were visiting had told staff they were not expecting a visitor and had not heard of them. They asked staff to check again with him and after supposedly doing so the same statement was repeated. Staff said they had spoken to him through a translation service. On leaving the detention centre and phoning the man they were due to visit, he told them that he was expecting the visit and no staff from the detention centre had spoken to him or asked him whether he was expecting a visit or not. Other visitors were told that they had not pre-booked despite their names being clearly visible on the pre-booked list lying on the reception desk. Supporters have vowed to try and visit the hunger strikers again to support them and intend to submit a complaint alleging that detention centre management attempted to cover up the hunger strike and illegally refused and lied to visitors to the company who manage Campsfield (Mitie), to the Independent Monitoring Board, to the HM Chief Inspector of Prisons and to the Minister for Immigration tomorrow (31 May) through their local MP. A demonstration in support of the hunger strikers for Friday 1 June at 6pm in Carfax, Oxford, has also been called by the local Sudanese community and various campaigning and human rights organisations. All are welcome. 3. The hunger strikers can be contacted by phone and are willing to give interviews to press but speak mainly Sudanese Arabic. Contact Nazar or Tim to arrange an interview. Today, 37 Iraqi and Afghan detainees on hunger strike in an immigration prison issued a statement and appealed for support from human rights groups. 23 Iraqi and 14 Afghan migrants in Campsfield, Oxfordshire, have been refusing food since Tuesday. ‘We are 23 Iraqi and 14 Afghan detainees being held at Campsfield House. The British Government want to send us back to Iraq and Afghanistan. it is not a safe place’. According to media reports and evidence collected by the International Federation of Iraqi Refugees, many of those who have been deported to Iraq in the past are now living in hiding, in fear of the persecution they originally left Iraq to flee. Some have been assassinated. Others have committed suicide only days after being deported or have been kidnapped and killed, while others have had mental breakdowns. Many more have had to leave the country and become refugees again. ‘The British government invaded and occupied both Iraq and Afghanistan, forcing millions of people to leave their homes’, says Dashty Jamal, Secretary of the International Federation of Iraqi Refugees (IFIR). ‘With this policy of detention and deportation, they are continuing to destroy the lives of thousands of Iraqi and Afghan people’. In recent weeks, many Iraqis have been detained apparently in preparation for another mass deportation flight to Baghdad. Across Europe, thousands of Iraqi and Afghan people have been detained and forcibly returned in recent years. IFIR has been campaigning against this policy. IFIR demands that the Iraqi government stops accepting people forcibly returned to Baghdad Airport and that the Iraqi government compensates deportees, providing them with work or unemployment benefit and supports them to rebuild their lives in Iraq and Kurdistan. The campaign has had widespread support both inside Iraq and across Europe. Tonight, supporters of the hunger strikers in Campsfield held a demonstration outside the detention centre. Inside Campsfield, all the Iraqi hunger strikers refused to speak with a representative of the Iraqi government who arrived to make preparations for the deportation. All of them want to remain in Britain where they have family and friends and have built their lives. They are determined to have their demands met; ‘if we don’t get these decisions for us as humans and for our safety we will not eat until we die, rather than to be made to return to these war torn countries’. Bill MacKeith of the Campaign to Close Campsfield said: ‘During the demonstration this evening I talked with the partners of two of the hunger strikers. They had been visiting. From the details of their cases, it is clear that the government is trampling on the rights of individual in order to drive forward with a ruthless and unacceptable policy of mass deportations to Iraq, a country described by the United Nations as unsafe. Both the detainees concerned, on hunger strike in Campsfield, have partners of some standing and children in the UK. Where is the right to family life in this? Demonstration in support of Iraqis and Kurds who went on hunger strike hunger strike earlier this week (7 June) in protest at being deported to Iraq (see statement below). UK government stop breaking up families ! 24 Iraqi refugees held in a detention centre in Oxford have started a hunger strike to protest against the government’s plans to deport them to Baghdad. More than 70 people are currently being held in detention centres around the country. Officials from the Iraqi government are currently visiting them to confirm their identities so that they can be deported, as part of an agreement between the two governments. The majority of the detainees have refused to meet with the officials in protest at their role in the deportations. ‘Some of us don’t have any homes or nowhere to go in Iraq. If we were returned we would be left to survive for ourselves on the streets with nothing, which isn’t. Some of us don’t even know if our family members are alive or dead because we haven’t had any contact with them for a long time. ‘While we have been in England, for all different amounts of times, we have lived here safely and got on with our lives. We have family and friends here. Being parted from them at this time is very hard and stressful for both sides. Some of us are engaged or married, and have wives here in England. We also have children here, some of us more than one. Some of our wives are expecting babies. They need to be together as families. There will be a demonstration outside the Iraqi Parliament in Sulaymania on Sunday 12th June to protest against the deportations. Today begins the European Week of Solidarity with the 300 hunger striking migrants in Greece. Over the years, European governments and the EU have steadily increased levels of repression against undocumented migrants, refugees and asylum seekers. In the detention centres of the UK, detainees have frequently felt compelled to undertake hunger strikes to express their anger and frustration and to draw attention to the injustices they have had to endure. Two of those who took part in the hunger strikes at Yarl’s Wood detention centre on February of last year are still being detained in prison, without charge! From the Campaign To Close Campsfield we send our warm wishes and expressions of solidarity to the 300 hungers strikers and their families and add our voices to the call for your demands.